[Tech Issue] Closed cockpits- Closer to reality then we might think? 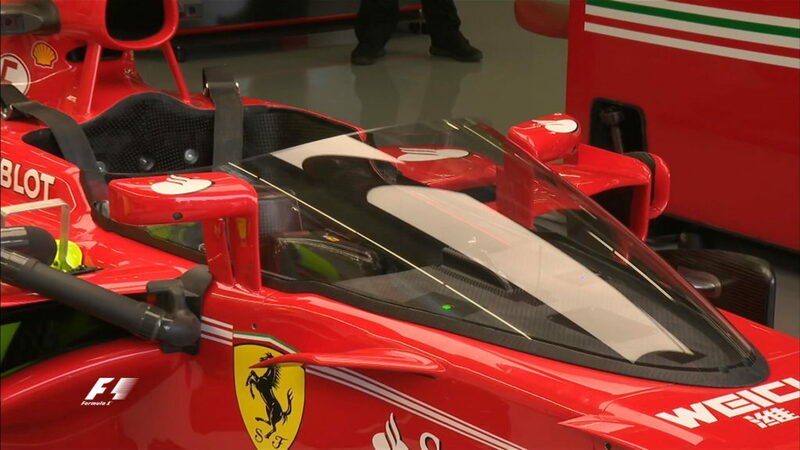 Looking at the Ferrari screen in comparison to the Indycar one, I can't find exact camera angle matches but the main frontal vision on the Indycar appears to be through a much flatter (less bevelled) screen. I would guess that it's the bevel in the F1 screen that would have cause vision distortion issues for Vettel. It's almost like they wanted the shield to fail. It's not called an 'Aeroscreen'. IndyCar used a much more fancier name for it. They called it a 'Windscreen'. Vettel only did the one lap with the 'Shield' during FP1 at Silverstone 2017. Not three laps. Same as Sports and GTs; pit crew remove during pit stops. Don't forget that the cars often do pit-stops far more often than an Endurance racer, so more opportunities to remove the tear-offs. Cannot see tear-offs being an option for F1. With sub 2 second pit stops now common in F1, there would not be enough time for a crew member to reach right into the cockpit area, rip a tear-off and move away from the path of the rear wheels in under 2 seconds. So the few seconds it takes to grab the tab on a tear off and pull it off should not impact IndyCar pitstop time. For F1, I expect it would impact it a bit more, but everyone will be in the same boat. In the ultra competitive world of F1, where 0.1 of a second makes a huge difference, everyone will not be 'in the same boat'. You will find drivers (or teams) choosing not the remove a tear-off if it will save them a millisecond. Even if the screen is fairly dirty. This is the likely scenario. BTW I’m not anti- just thinking practically...... I hate the halo! Well I am anti screen. I hate the shield. Hate the Aeroscreen too. But like you, I absolutely hate the Halo the most. They all do not belong in F1. It is a stupid idea, and just a knee jerk reaction by the FiA. Cannot see tear-offs being an option for F1. I am not going to quote all your points, but generally agree with your arguments, but feel they don’t support your position. In fact, I think they just reinforce how they probably wouldn’t be a problem. And yes, they would all be in the same boat in that they all would have to deal with the issue. Of course individual situations will impact drivers differently. If someone feels it’s not dirty enough to be torn off, then leave it alone. It’s not like you have to pull one off at a stop. Anyone who leaves an overly dirty one on just to save a tiny amount of time in the pit (but is then slower on track due to poor visibility) is foolish. Some drivers stuck in tight battles in which they follow others closely may have more problems than someone leading or running alone. It’s no different than a myriad of other things that factor into how an individual drivers race progresses. IndyCar windscreen test, from the drivers point of view. Watching that video makes me feel dizzy knowing that Ferrari rejected the shield after a single lap and no other team got to test it. Thanks for the link. It’s very telling (clearly it’s workable from a visual perspective). Reports are that Vettel passed out while watching this! What is apparent from the outside shots is that the "visor cam" what not in line with the driver's eyes. Dixon was seated well below the top of the windscreen, but the view from the camera was interrupted by the top of the windscreen. So, what the YouTube demonstrates is not a true visual of the impact of the windscreen. And the FIA should have used some of those millions of dollars that they received from the sale of FOM to properly evaluate all avenues for stopping the ingress of FOD into the cockpits of cars. They should have never allowed the teams to dictate and test their own handy work. Yet another case of the team's tail wagging the FIA dog! slightly biased there, mike, i don’t think the teams wanted the halo either. but they were wrong to dismiss the windscreen so quickly for certain. something just smells fishy about the way the halo was implemented. Not biased, Bella; cynical, maybe, but not biased because I hate them both. My personal view is that now that the drivers are sat so low within the bodywork that they might as well utilise a full canopy, and just have a large icon affixed to the bodywork to denote the driver's helmet. This is all about safety, after all. You can see the positioning of the Visor cam here. If anything, YouTube makes the onboard look worse because of the higher camera. It'll actually be even better for the drivers. We still haven't seen a visor cam of the Halo. Or talked about seeing flags, start lights and that sort of thing. But you don't need to test concepts thoroughly when it has absolutely nothing to do with the best product or safety, and it's purely political agenda. For what political gain? What’s the motive that the FIA has to risk the lives of the drivers as accused? Are they on a kick back from the halo manufacturers? Did a windscreen manufacturer’s daughter once shun Jean Todt? I am obviously issuing this, but what are we actually accusing the FIA of?